This 65m2 open-space type flat with 2 rooms, leading both to the big kitchen and work area, has been renewed this year. In the bedroom there are 2 single beds and a wardrobe and in the living room a studio bed (2 beds). There is also bed linen and blankets. The kitchen has a stove, fridge, microwave, toaster and tableware, pots and pans, cutlery. 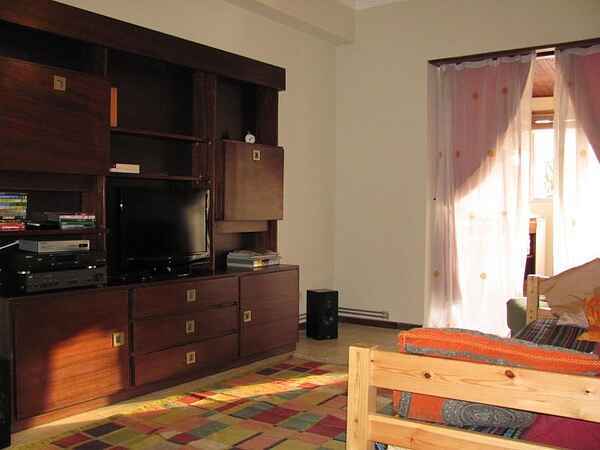 There is also an iron and vacuum cleaner, cable-TV, Internet and Hi-Fi with DVD/CD player, gas and electrical heating. The bathroom has a shower. There is also a big balcony with a fireplace where you can grill sardines (hmmm!) in the summer.